with your colleagues, friends and family members! Create a team to walk or run and register in the Crossroads Relay. 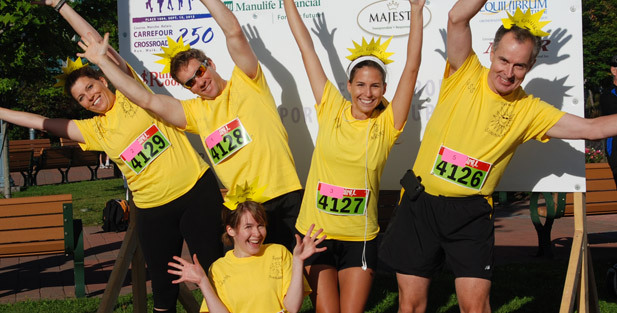 Whether you are a runner or walker, you will share a wonderful experience with the members of your team. Our mission is to help women and their children living with family violence by using all funds raised by the run to support Crossroads for Women. The Crossroads Relay gives people a chance to team up, raise funds, and if they like, have some light-hearted competition in support of a worthy cause. Your efforts, your steps, and your awareness help improve the lives of women and their children in your community. Easily accomplished with five teammates running or walking 10 km combined. Team Captain will create and pay for entire 5 person team. You do not need to register your team members at this time. This idea came to life over coffee when friends were looking for a corporate event to help build team spirit with their employees and encourage them to become more active. When they decided on the type of activity they wanted, all they had to do was find a community organization that would benefit from it. Crossroads for women is a cause that was dear to Mr. Claude Savoie, father to Andrée and David Savoie and founder of Acadian Construction, who passed away in 2000. In his honour, it was important for us to continue that support. In addition, all committee members know people in their surroundings that have experienced family violence. We were all quite upset to discover how enormously pressing the needs were in our region. It is outrageous to think that almost one third of the mothers who present themselves with their children and the police at the Crossroads Center for women are refused at the shelter because of a lack of space. These women are forced to find another place to stay or return to a violent household. The courage those mothers had when they left their environment to go to the shelter, accompanied by the police, to seek help might never return even if they need to seek help again. We consider ourselves to be privileged in our own lives and this is our way of giving back to others who are going through unimaginable challenges.